Terming the incident unfortunate, the national carrier Air India has tendered an apology to the Indian table tennis team, who were denied boarding on the Delhi-Melbourne flight on Sunday. In a statement, an Air India spokesperson said, "This was a very unfortunate incident, we apologise to the players and we are arranging next available flights." on Sunday, table tennis player Manika Batra took to Twitter stating that the Indian contingent, comprising 17 players and officials of Indian table tennis team were denied boarding on the Melbourne-bound flight due to overbooking. Batra had also tagged Sports Minister Rajyavardhan Singh Rathore and Prime Minister Narendra Modi's office in her tweet. "Our contingent of total 17 players and officials of Indian table tennis team including CWG medalist myself, Sharath Kamal, Mouma Das, Madhurika, Harmeet, Suthirta, Sathyan were supposed to fly today to Melbourne by AI 0308 to participate in ITTF World Tour Australian Open from tom," the player tweeted. "On reaching Air India counter we were told that flight is overbooked and only 10 members of TT team can fly which left us in a shock.7 of us are still unable to fly. All the tickets were booked by Balmer Lawrie. @Ra_THORe @PMOIndia Shocked at such mismanagement by @airindiain," she added. 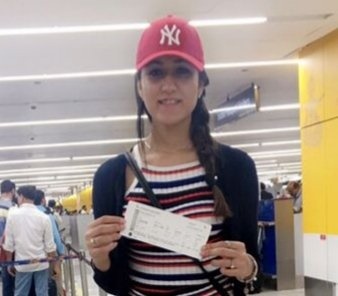 However, Batra later posted a photograph of herself on Twitter with a boarding pass in hand and thanked Neelam Kapur, Director General of Sports Authority of India, for taking prompt action in this regard. The Indian contingent was scheduled to participate at the ITTF World Tour Australian Open which is set to begin today in Melbourne. Sarkari flight ho ya bus yahi haal h... overbooking ... Yahan bas yahi drawback h k plane ki roof pe baith k nhi ja sakte aur bus ki roof pe baith k ja sakte Hain. Australia apologises to Indian doctor Haneef over wrongful terror charges. Australia apologises to India for attacks on students! !